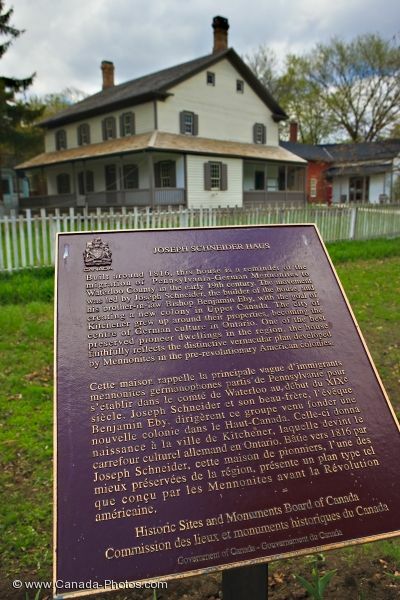 An information sign detailing important facts about Joseph Schneider Haus, a National Historic Site in Kitchener, Ontario, stands outside the white picket fence. Built in 1816, the Joseph Schneider Haus building is the oldest known dwelling in Kitchener, Ontario and was declared as a National Historic Site. Over the years, it was restored to its appropriate time period and reopened in 1981 as a history museum. Along the exterior of the white picket fence, an information sign provides details of Joseph Scneider Haus. Joseph Schneider Haus and his family, along with a few other pioneers, arrived in Ontario in 1807 after leaving Lancaster County in Pennsylvania. They started a new life here in farming on 448 acres and nine years later, Joseph had a sawmill and home made for his family. His family continued to grow and one of his sons eventually took over the business creating a rewarding life. The house stills stands in its original location and people can admire its beauty and explore the collection of artifacts in the history museum. Picture of the information sign relating to Joseph Schneider Haus in Kitchener, Ontario. Information sign at the The Joseph Schneider Haus, a National Historic Site of Canada, in the city of Kitchener,Ontario, Canada.